Hey guys! How are you all doing today so far? Well, today I'm going to post the smoothie recipe I promised yesterday...but FIRST, we must master cutting pineapples and become pineapple ninjas, as my friend called me one night. My Filipino mom is the true pineapple warrior. She can just hold the huge fruit in her left hand above the sink and slice away with her right hand. I, on the other hand, prefer a cutting board for my weakling hands. Here's how ya do this! First off, I prefer using a big knife to cut. The one I have pictured is by Cuisinart, I think. 1. Cut off the top and bottom of the pineapple. Supposedly, you can leave a little extra fruit on the top when you cut it off, replant it, and then it grows into another pineapple. But maybe that's a myth? I've tried it twice, and it never worked for me. Maybe that has something to do with my part-time occupation as a plant-killer. 2. 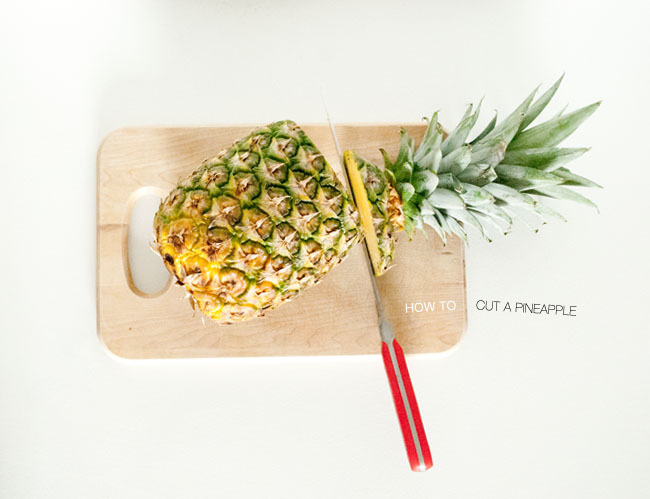 Begin slicing down the sides of the pineapple. Surprisingly, it doesn't require much pressure. 3. 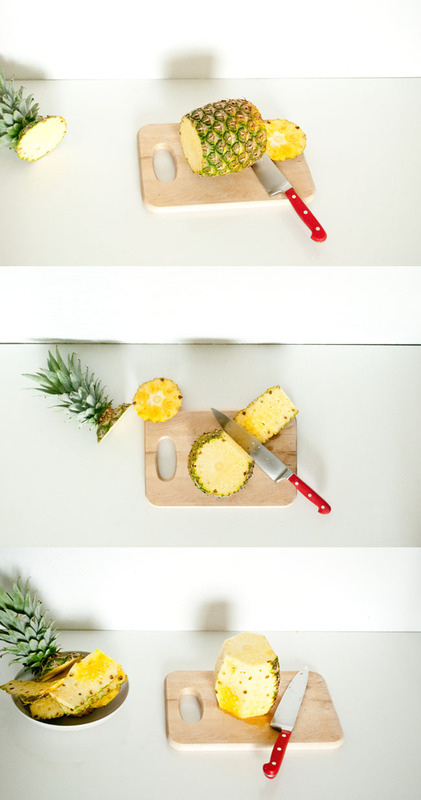 Keep slicing all around the pineapple until it's free of the outer shell. 4. You want to get rid of those hard brown specks left over from the shell, so just slice at an angle into the fruit (kinda triangle-like) so as not to waste a lot of the fruit. 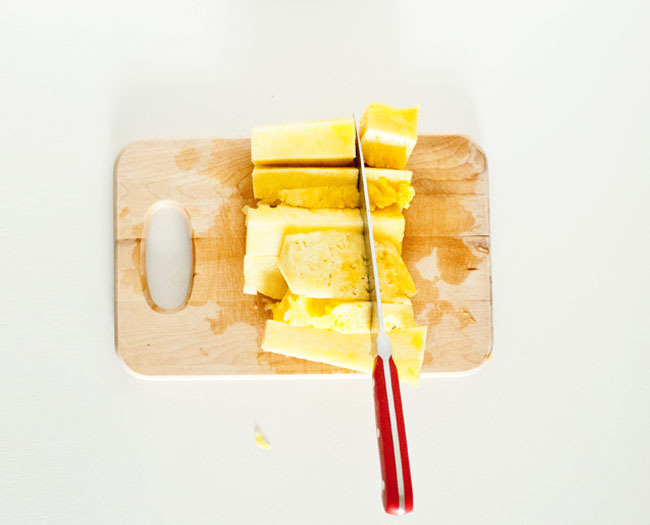 Usually the brown specks form in a diagonal pattern around the pineapple, so you can cut long angled strips around the pineapple until the specks are eliminated. 5. Now cut the pineapple in four sections, avoiding the center rind. 7. Cut the four sections into long strips, and if you'd like, you can dice the fruit into big cubes like this. Now that was super easy, right? You can always buy whole pineapples now and save your extra pennies for fun stuff...like shopping! Not the boring grocery-kind-of-shopping. Now this is so helpful! I always wondered! Anna: Oh! I'm so glad it helped someone! :) Thank you so much! !